The Group also have been donated several collections of photographs and paperwork at present they are being scanned, sorted and catalogued — this is a mammoth task. So far, about 5000 photographs from these collections have been scanned, and they have regularly featured in displays in Langholm. 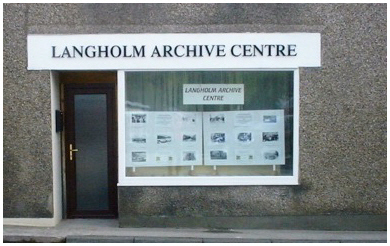 Should you be in Langholm, and notice the sign "Langholm Archive Centre", please call in if the Centre is open. The volunteers have a wealth of local knowledge, and if they don't know the answer, then they may be able to point you in the right direction. The Archive Centre does have some local memorial inscription booklets for sale and our "Langholm Through the Ages" booklet is a must to researchers who wish a concise record of the town and surrounding area. We also have available for sale three DVDs of photographs from our collections.